Case Western Reserve University (CWRU) School of Law has named a new director and co-director of its Frederick K. Cox International Law Center. 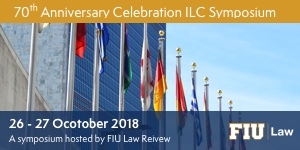 Established in 1991, and funded with a three million dollar endowment, the Frederick K. Cox International Law Center is the hub of CWRU’s international law program. Michael Scharf has served as the Center’s Director for the past sixteen years. Since becoming CWRU’s Co-Dean in 2013, Scharf has continued to direct the Center with the assistance of several faculty and staff. Now CWRU has announced that Steven Petras, a long-time CWRU adjunct professor, has accepted the position of the director of the Frederick K. Cox International Law Center. Petras, who retired in December as a partner from BakerHostetler, has served as Chairman of the Board of the Cleveland Council on World Affairs, President of the Greater Cleveland International Lawyers Group, Chair of the Cleveland Metropolitan Bar Association’s International Law Section, and President of the Cleveland World Trade Association. He is currently Chair of the Board of the Council of the Great Lakes Region and US National Director of the Canada-U.S. Law Institute. Joining him will be Professor Juscelino Colares, who has taken on the role of co-director. Dr. Colares (PhD, JD) clerked for the Hon. Jean-Louis Debré, Chief Justice of France’s Constitutional Court (2008-09 term) and practiced at Dewey Ballantine, LLP, Washington, DC, where he litigated trade cases before federal agencies, federal courts and NAFTA panels. Colares served last year as the Chair of the University Faculty Senate. He was recently reappointed by the Office of the United Trade Representative to serve on the United States Roster of NAFTA Chapter 19 (Trade) Panelists. Colares' research has been published in leading peer-review journals, including the American Law and Economics Review, Journal of Empirical Legal Studies, Journal of International Economic Law, Journal of World Trade and Jurimetrics. The Cox Center’s other officers are Professor Richard Gordon, Associate Director of the Cox Center and Director of the Institute for Financial Integrity, Professor Avidan Cover, who serves as director of the Institute for Global Security Law and Policy, Adjunct Professor James Johnson, who serves as director of the Henry King War Crimes Research Office, and Professor Timothy Webster, who serves as director of Asian Legal Studies. Dean Scharf will remain involved in the activities of the Cox Center, including as co-coach of the Philip C. Jessup International Law Moot Court team which has reached the international rounds seven times in the past fourteen years and won the world championship in 2008.